When I first went to High Tone Auto Body I got a good feeling that Audi was a straight shooter. He dealt with my insurance claim and another dent that was not part of the claim with speed and efficiency and was very flexible with my situation. If I have any more auto body needs I will definitely go to them again. 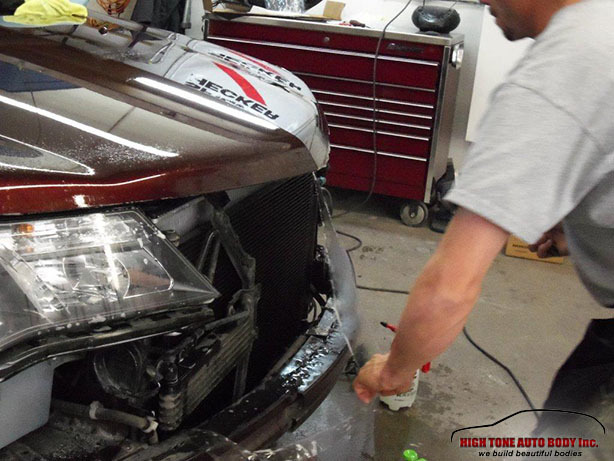 Rocky’s vehicle needed a hood and fender tip clear bra installation as part of his claim. 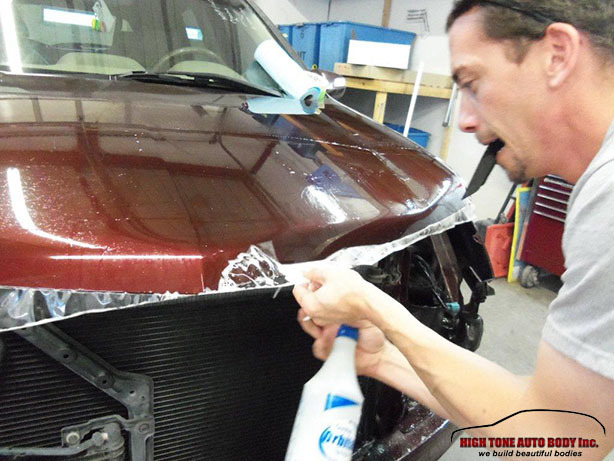 Clear bra is a thin paint protection urethane film that is virtually invisible and allows for a clear coat like finish for maximum shine. 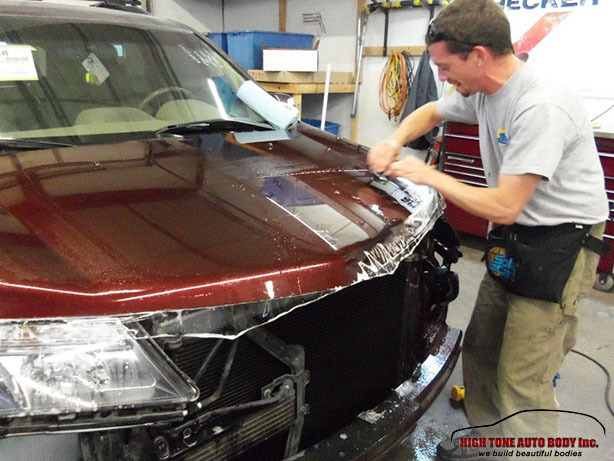 Clear bras can protect your vehicle paint from rock chips. 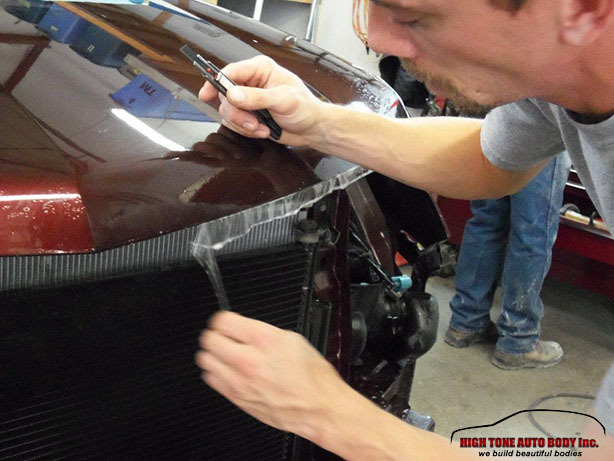 Application of Xpel protection film on the hood is generally from 12 -18 inches wide. 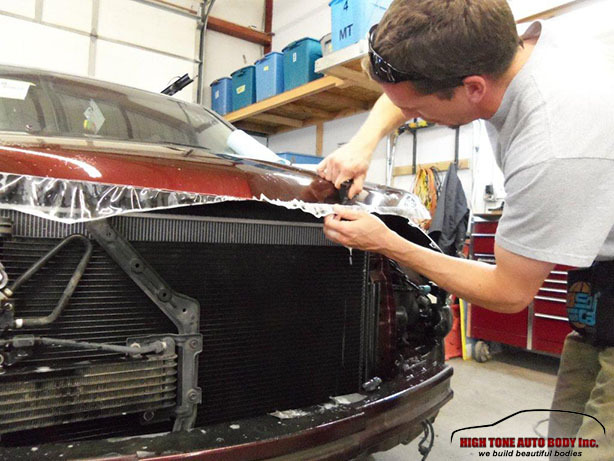 It’s the easiest and most elegant way to ensure your hood remains chip free and still be shiny after years and years of driving on our Colorado roads. Even though Rocky’s insurance claim was done by an Independent Appraiser, we went the extra mile and removed the near by dent for free that was not part of the claim. 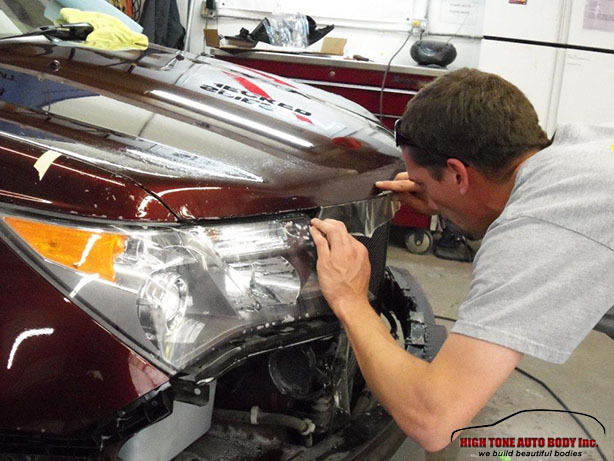 Rocky learned that there is a difference in how claims are handled by an Independent Appraiser versus how the claim would be handled by High Tone Auto Body that is a partner with many insurance companies and is a participating auto body repair shop in the Direct Repair Program. 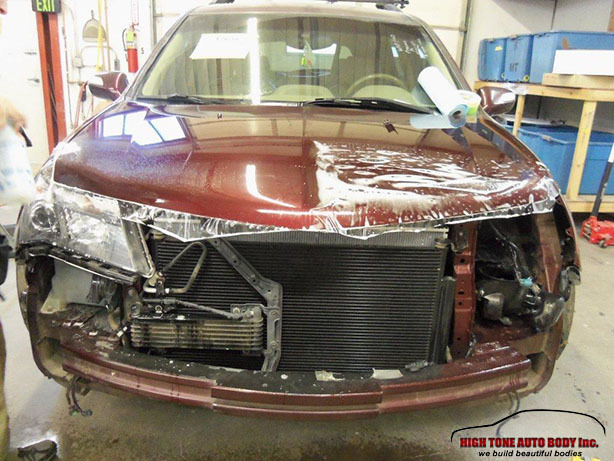 Basically, insurance claims that are done through an Independent Appraiser take longer for approval (3-10 business days), whereas insurance companies that have partnered with High Tone Auto Body generally have a faster turn-around time because everything is done electronically and we are the eye’s and ears for the companies. 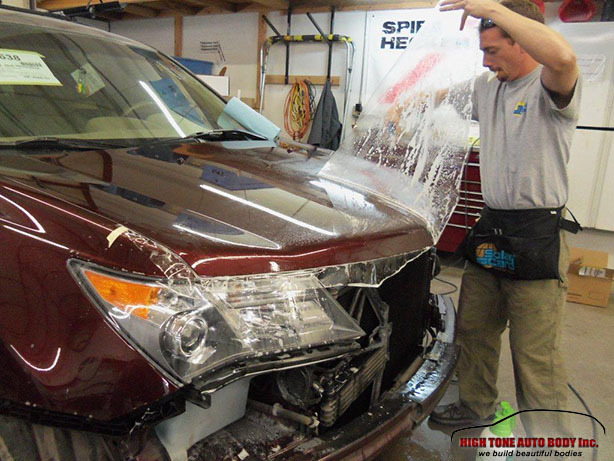 High Tone Auto Body is there for you and will handle all the insurance paperwork for you regardless of your insurance company once you have filed the claim. To prevent paint and small auto body repairs, you should seriously consider getting a Clear Bra Installation for your vehicle too. With four seasons in Colorado your vehicle is exposed to the elements year-round. 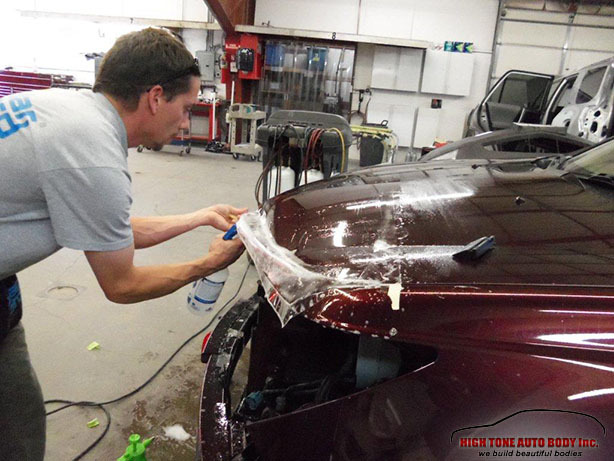 Clear bra protection films can help prevent rock chips and scratches to your paint. 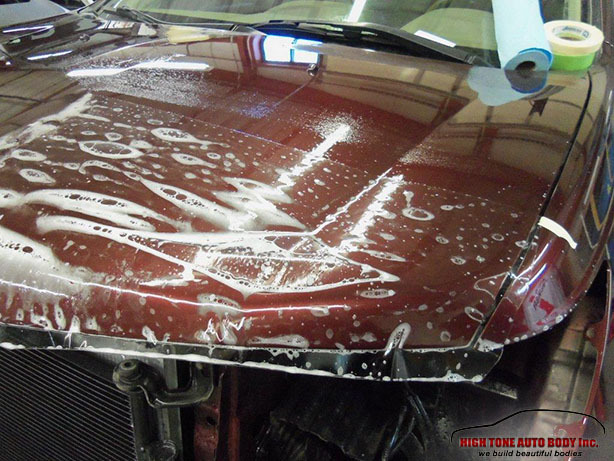 It will also minimize any rust from starting on you hood due to rock chips and help prevent tree sap from staining your paint. Clear bra’s do not prevent dents. Do I Really Need Clear Bra? If you are a car driver for at least a year in the Aspen-Basalt area, you know that our roads are the best and most reliable source of rock chips and dents. Not that anybody would want them, but it’s quite inevitable: you drive behind a car and keep your distance, but somehow, those small sharp-edged rocks end up scratching your front bumper and hood. No matter how careful a driver you are, it doesn’t take much to get that perfect paint job ruined. If you find yourself wanting protection from at least one of the listed car hazards, your car needs clear bra installation.